Judicial gatekeeping on expert testimony is often discussed as a concern about junk science – with an implication that anything not plainly lacking in scientific basis is a mere question of persuasiveness that should therefore go to the jury. The New Jersey Appellate Division recently took that concept to its extreme conclusion, holding that whenever a well-credentialed expert relies on some sort of scientific data and can offer an explanation for his conclusions, that testimony must be admitted, no matter the methodological flaws. Those flaws go merely to the strength of the testimony, the panel determined, and weaknesses can be exposed on cross examination and countered by other experts. As a result, the trial judge’s studied judgment to bar flawed expert testimony in the ongoing In re Accutane Litigation was reversed. In a brief filed this week in the New Jersey Supreme Court, we argue that focus on “junk science” is misplaced, and in fact has it backwards. Identifying obvious “junk science” may be relatively easy for a jury. Where judicial gatekeeping is most critical, and where flawed expert testimony is most dangerous, is rather where a well-credentialed expert presents an interpretation of the underlying data based on flawed methodology that jurors are ill-suited to evaluate. What Do Juries Do Best? Juries function best when evaluating credibility of ordinary witnesses, aided by the adversarial process. 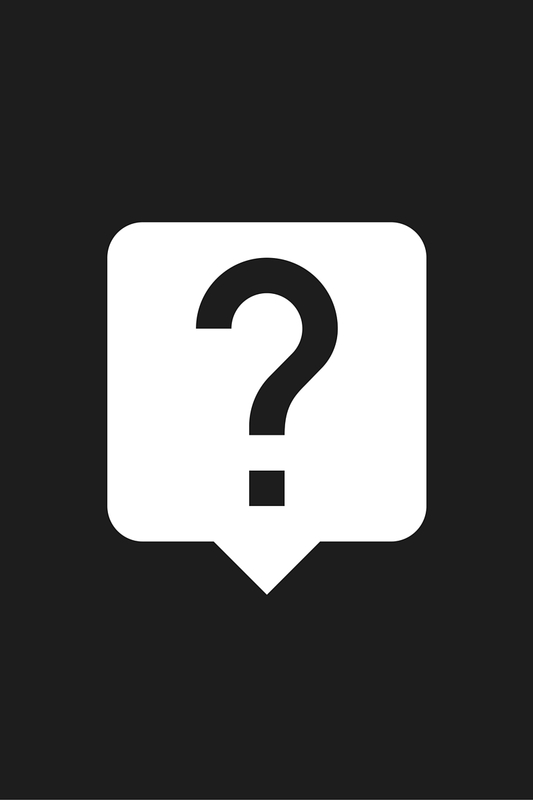 Inconsistencies can be revealed through cross-examination; erroneous and false testimony can be countered by opposing witnesses. Jurors can then arrive at their own conclusion as to whether the stop light was red or green. But jurors are more easily misled when presented with competing interpretations of scientific data. Studies demonstrate that jurors struggle to make methodology-based distinctions when evaluating expert testimony. Juries presume the legitimacy of admitted evidence, and do not reliably distinguish between low and high-quality evidence. And the adversarial process does not effectively assist jurors in recognizing flaws in expert testimony, in part because jurors lack the opportunity to delve into the underlying studies to make their own critical evaluations. Judges, by contrast, have the opportunity to immerse themselves in the relevant studies and make meaningful inquiries into the methodological soundness of proposed testimony. Especially in the case of MCL judges, they even have the opportunity to develop some familiarity with the type of scientific and technical disputes that occur frequently in medical causation cases. Of course, as part of that evaluation, judges must also justify their decision – and their analysis is more readily reviewable on appeal, further enhancing both accuracy and predictability. The focus on “junk science” therefore gets it precisely backwards. A standard that would permit well-credentialed experts to offer “plausible explanations” would eliminate judicial gatekeeping in those cases where jurors are least equipped to assess scientific validity and methodological soundness, and where judges’ comparative advantage in evaluating complex scientific theories highest. The solution is to adopt a standard that is not limited to a screen for well-qualified experts opining on scientific data, but that requires rigorous judicial scrutiny of the analytical process itself, and that provides trial court judges reliable guidance in their gatekeeping responsibilities. Adopting the Daubert standard to expressly align New Jersey courts with the prevailing standard in federal courts and vast majority of other state courts would provide New Jersey judges with effective guidance on thorny methodological issues and ensure predictable and robust judicial gatekeeping in New Jersey state courts. Click here to read NJCJI’s brief. 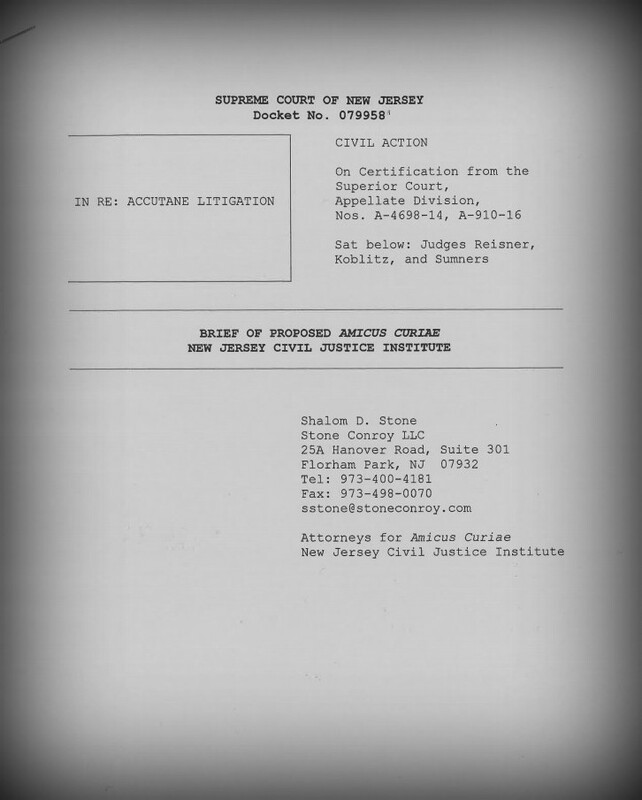 Thank you to Shalom Stone of Stone Conroy LLC for his work on this case on NJCJI’s behalf. A selection of the need-to-know civil justice news for December 9-15. Gov.-elect Phil Murphy on Tuesday announced the Bergen County prosecutor as his nominee for state attorney general and vowed that his pick will lead the fight against the Trump administration on issues ranging from health care to voting rights and the environment. The New Jersey Supreme Court reinstated a medical malpractice lawsuit against Newark Beth Israel Medical Center that had been tossed over the late submission of an expert witness’ statement, ruling on Thursday that the parties had been entitled by law to a conference to discuss any concerns about the testimony. The New Jersey Supreme Court on Monday ruled that an employment contract barring third-party lawsuits wasn’t enforceable under the state’s workers’ compensation law because it contravenes public policy, but a trial court must still determine if the suing employee was partially liable for the injury that prompted his suit. 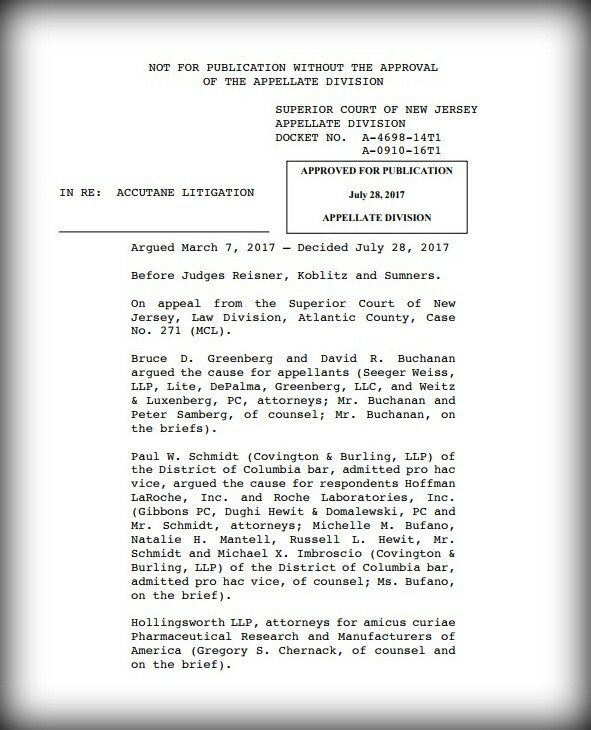 Hoffmann-La Roche Ltd. has convinced the New Jersey Supreme Court to review two state appellate decisions related to the company’s acne medication Accutane, with the justices agreeing to consider rulings over the adequacy of the drug’s label and the admissibility of expert testimony. Follow @NJCivilJustice on Twitter for even more news. The Appellate Division has issued a significant published opinion in the ongoing legal battle over the acne drug Accutane. Over 2,000 claims were revived by this decision. If upheld by the New Jersey Supreme Court, the long-term effects of the decision will be even more noteworthy, as it all but eliminates the existing, critical gate-keeping role of trial court judges on admissibility of expert testimony. The Accutane cases have been winding their way through the New Jersey court system since being designated as Multicounty Litigation (MCL) in 2005. Plaintiffs allege that the acne drug Accutane causes inflammatory bowel diseases, including ulcerative colitis and Crohn’s disease. The Appellate Division panel of Judges Reisner, Koblitz and Sumners overturned Superior Court Judge Nelson Johnson’s decision to bar testimony by plaintiffs’ experts and dismiss some 2,000 cases that relied on that testimony. Although the courts have been inconsistent in their adherence to existing New Jersey Supreme Court precedent as prescribed in Landrigan, this Accutane ruling is a significant departure from existing case law. The Appellate Division in this case held that as a matter of law, the trial court judge is actually precluded from exercising that degree of scrutiny, and instead must permit the expert to testify so long as he or she relies on the type of data and information reasonably relied upon by experts in the field, and offers some sort of explanation to justify that reliance, regardless of whether it involves a reliable and consistent methodology. If upheld, this new standard would make New Jersey an extreme outlier on the admissibility of expert testimony. The federal courts and the vast majority of other state courts currently require a two-step process, as described by the U.S. Supreme Court in Daubert and codified in the federal rules. The judge must determine not only that the testimony is the product of reliable principles and methods, but also that the witness “has applied the principles and methods reliably to the facts of the case.” Under the Appellate Division decision, that sort of rigorous scrutiny would be precluded as a matter of law. Limiting the judge’s role to excluding obvious “junk science” also misses the need and rationale for setting a higher standard of reliability for expert testimony. Even well-credentialed scientists should not be permitted to speculate based on incomplete data using inconsistent methodologies. While the Appellate panel took exception to Judge Johnson’s characterization of plaintiff’s experts as “hired guns,” the “hired gun” phenomenon is precisely the reason rigorous gate-keeping on expert testimony is an essential judicial responsibility. Experts in litigation are not neutral advisers. Parties to litigation control the selection of expert witnesses, and choose those willing to testify to their party’s theory of a case. That “adversarial bias” means juries are typically presented with a biased selection of expert opinion. It therefore falls to the courts to filter unreliable testimony and ensure that the opinions jurors hear are based on reliable methodologies, applied consistently and reliably to the underlying data. The abdication of the gate-keeping role is likely to make the New Jersey courts a magnet for out of state plaintiffs, an effect amplified by the U.S. Supreme Court’s recent Bristol-Myers Squibb decision, which significantly limited venue options for litigants. Already known for its inconsistent standards for expert testimony, an outright prohibition on the sort of rigorous scrutiny applied almost everywhere else in the country would make New Jersey the jurisdiction of choice nationwide for claims based on unreliable expert testimony. Roche has already announced that it will appeal this decision to the New Jersey Supreme Court. The New Jersey Civil Justice Institute will continue to provide updates as the cases progress. If you have questions or comments about this litigation, please contact Alida Kass. Our court system shouldn’t have to deal with suits over the length of sandwiches, amusement park rides that make kids too dizzy, and gassy co-workers. But it does. Why? Because numerous state laws explicitly encourage litigation when other means of dispute resolution would be quicker and more cost effective; poorly drafted statutes invite endless lawsuits over their interpretation; and antiquated policies limit the ability of our state to improve its legal climate. Things have gotten so far off track, New Jersey has been named one of the nation’s worst “judicial hellholes.” At this point, there is nowhere to go but up, and the time is right to make changes, both legislatively and via judicial action. Click here to read our 2017 agenda, which is focused on bringing some common sense reform to our legal system. License plates dub New Jersey the “Garden State,” and while this densely populated state is known for growing eggplant, blueberries, and cranberries, it is also known for growing litigation. New Jersey is fertile land for plaintiffs’ lawyers, who use the state’s consumer protection laws and the court system’s easy access for out-of-state plaintiffs to bring frivolous lawsuits and score big payouts. New Jersey’s rules regarding the admissibility and review of expert testimony have remained unchanged since 1991. In this same period, the Federal Rules of Evidence, the Uniform Rules of Evidence, numerous state evidence rules, and our own jurisprudence have all changed to reflect the increased importance and use of expert testimony. The disconnect between the rules on the books and the realities of practice were on full display at the New Jersey Supreme Court’s May 19, 2015 hearing on the Committee on the Rules of Evidence’s latest report.